Deede Uche's World: CATECHIST JOSIAH TAYLOR AZUBUIKE OGBONNA (a.k.a. Dee Taylor), 1935 - 2014. 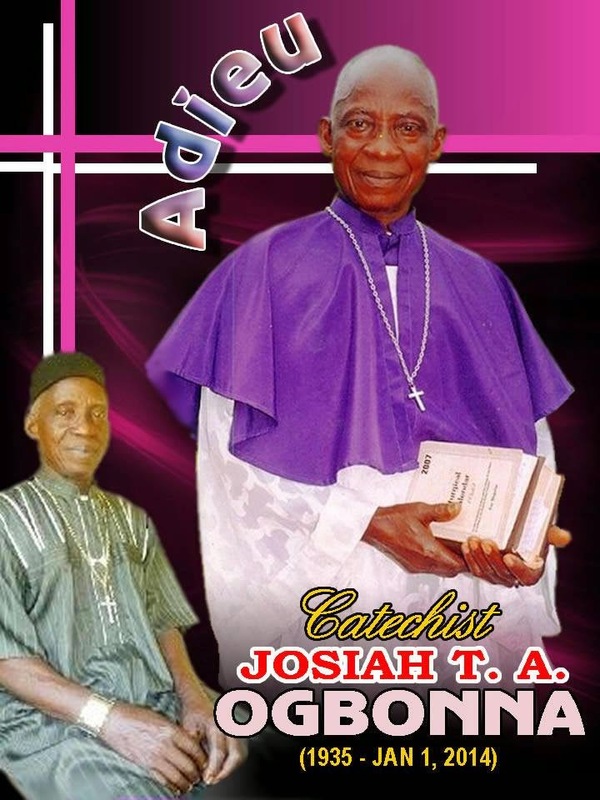 CATECHIST JOSIAH TAYLOR AZUBUIKE OGBONNA (a.k.a. Dee Taylor), 1935 - 2014. CATECHIST JOSIAH TAYLOR AZUBUIKE OGBONNA (a.k.a. Dee Taylor) of St. Benedict’s Catholic Parish Ntigha, Aba Diocese Nigeria was born on July 25, 1935. Before retiring as a Headmaster in 1992, he joined the services of the Church as a Catholic Catechist in 1986. 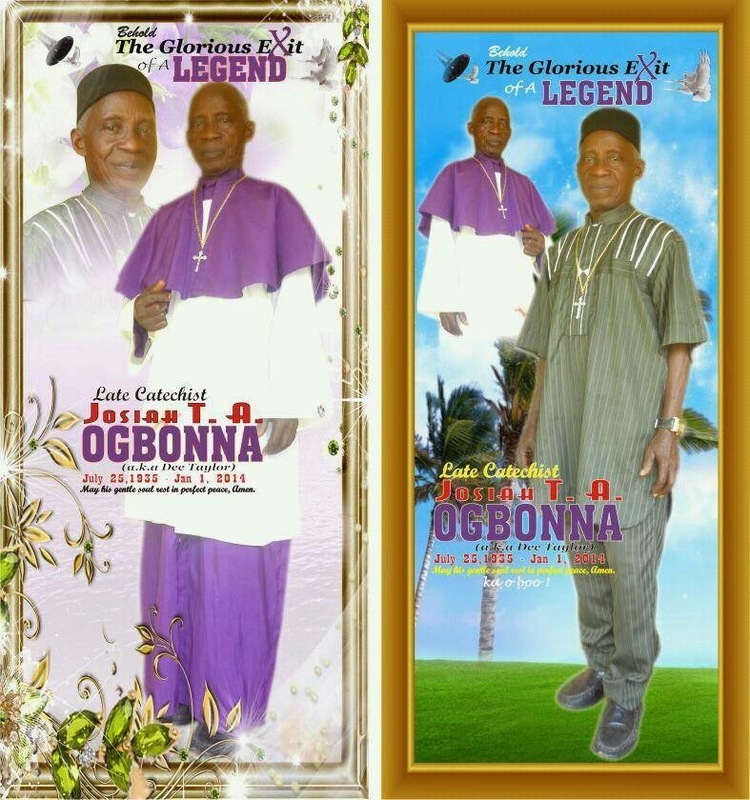 He served as a Catechist in the then Ngwa-ukwu Zone under St. Anthony’s Catholic Parish Nbawsi (1986-1990), and in St. Benedict’s Catholic Parish Ntigha (1990-Jan 1, 2014), all in the Catholic Diocese of Aba, Nigeria. He died on January 1, 2014 which would have been his 79th year, and 28th year as a Catechist. He is survived by his wife, five sons, daughters-in-law, grandchildren, his siblings and their families, and a host of other relations. Eternal rest grant to him Oh Lord, and let perpetual light shine upon him. May he rest in peace, in Jesus name, Amen. 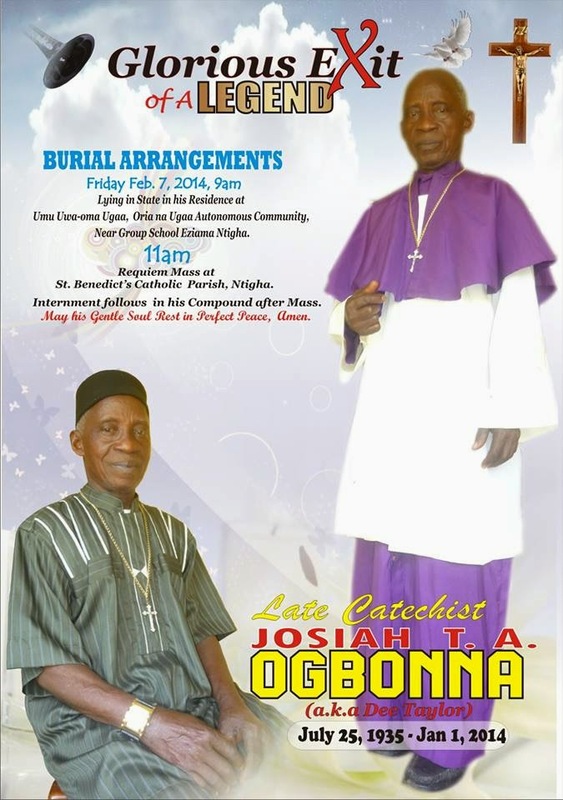 Below is the video of the funeral ceremony held on February 7, 2014, at his compound in Umu Uwa-oma, Ugaa in Oria na Ugaa Autonomous Community, Isiala Ngwa North LGA., Abia State, Nigeria. The Requiem Mass was held at St. Benedict's Catholic Parish Center Ntigha, Catholic Diocese of Aba, Nigeria. Adieu Dee Taylor. May God rest your soul in Jesus name, Amen.